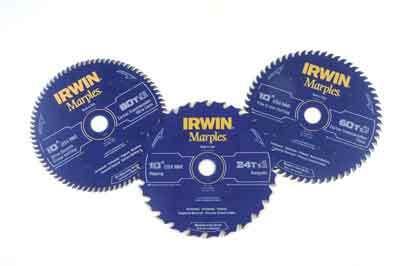 IRWIN Tools launched their new IRWIN Marples range of circular saw blades a while ago. We have had the chance to use them in our workshop and I think it's fair to say they are really good performers. They are made in Udine, Italy to a very high-quality standard, with a low noise level. 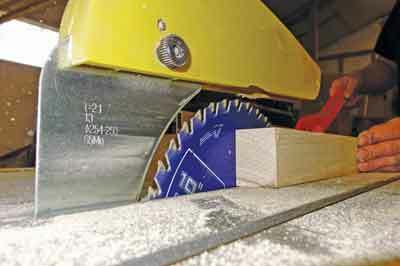 They are fast and clean cutting with a range to suit all machine types. The Marples blades have a blue PTFE coating with aluminium flakes in the coating, which keeps the blades running cooler. They are available in a variety of sizes from 216mm and 24 tooth up to 305mm and a maximum 100 tooth with plenty of choices in between. Kerfs are available in thicknesses between 2.5-3.2mm. The blade packets are clearly marked for each specific usage, e.g. mitre, table and mitre and multipurpose. The range is further broken down into alternate top bevel, high alternate top bevel and triple chip grind, which gives you 28 blades to choose from. We have been using a 250mm diameter general purpose blade in our tablesaw and a 300mm in a compound mitre and they both give a very fast, clean cutting result without imparting any stress on the motors at all. Also, be sure to check out the WeldTec range with welded - not brazed - teeth for tackling metal found in wood or, alternatively, the construction range of blades. 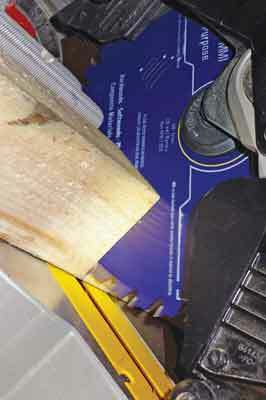 IRWIN now has an online digital circular saw blade selection guide, which is also available for iPhone and Android. It allows you to input your chosen machine and it gives you the available blade choices.